Electronic pressure cooker is a frequently used kitchen appliance in daily life. Pressure cookers of course care more about some questions about the pressure pot especially for a cooking newbie. To help you quick start a great meal at home, BESTEK has collected some frequently asked questions with the hoping that everyone can use the cooker properly and safely. What’re the advantages over traditional cookers? Compared to traditional cooker pots, BESTEK electronic pressure cooker makes food in a sealed space so that the nutrition of food will be fully reserved and ensure a complete healthy meal. High pressure can make any tough food soft in a short time, so you can cook grains or meat as you like and provide the kids and elder nutritious food that is easy to chew. Besides, BESTEK pressure cooker is built-in full safety protections to avoid potential dangers, mush safer than traditional cookers that is heated by fire. How does a pressure cook? 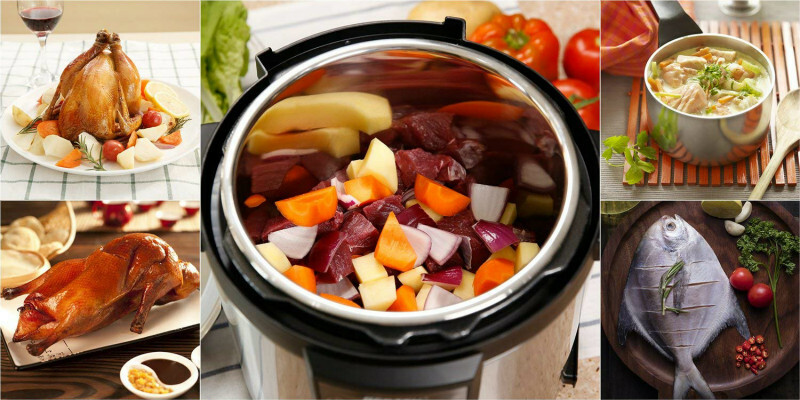 The electric pressure cooker is heated up by a heating element and the vapor will be sent out and accumulated inside the sealed pot, thus making a high pressure in such a salad container. When pressure reaches to a certain point, the high pressure can make boil and stew any food in a short time. How to guarantee the security? BESTEK pressure cooker pot comes with overall safety protections to ensure you a safe cooking environment. 1.Pressure switch: the cooker will power off automatically if the inside pressure rate reaches to the preset pressure. 2.Vent valve: the cooker can exhaust vapor automatically when the pressure switch breaks down. 3.Manganese Piece: the manganese piece will deform automatically and the pot cover can relief pressure when the pressure comes to 150-180KPA because of pressure switch breakdown and vent valve blocking. 4.Opening and closing cover security system: when there is high pressure inside the pot, the cover can’t be opened and you can open it until all the pressure emits. Why pressure cooker is leaking air? 1.The components are not well installed after washed. 2.Inner pot deforms because of improper use. 3.There is food debris in the seal ring. When the inside pressure comes up to its rated pressure, the pressure switch will switch off. If the inside temperature reaches to a certain level, the pot will stop heating and keep in a holding time. In that case, the time will count down accordingly. What is BESTEK pressure cooker working pressure? The working pressure is 1-70KPA. The above six questions can help you know about electronics pressure cooker and make it easier and safer to use the pot in the kitchen.